Another busy summer has seen installation teams from Custom Covers working all over the UK, including three concurrent sites in Scotland. Decorative interior Linings were installed for the Scottish Open, The Open championship at St Andrews and the Gleneagles G8 summit. All three were completed on time and to a very high quality of finish. The press reporting Hilary Iskander, director of Newsteam International commenting on the G8 "The media centres have been buoyant without being flamboyant. 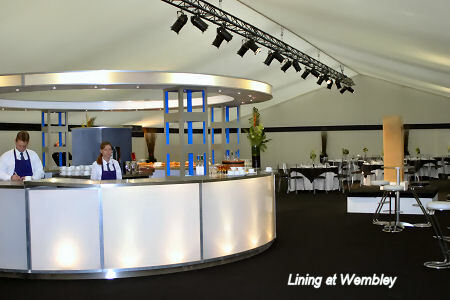 They are smart and stylish, in particular the veranda bar which appealed to us all. The organisers have done a superb job creating this environment - we'd never guess we're working in the middle of a field." The season started with linings for the temporary Arena at Wembley and has continued with Aintree, Stella Artois, Wimbledon culminating in the largest ever structure at Doncaster for the St. Ledger.